There are many paths to a sustainable future, but they all require social, cultural and political change, and new ways of thinking. New research is essential to meeting this challenge, but it’s not enough on its own. We need a new generation of sustainability researchers with the skills to become advocates for change. Our training program is a unique, bespoke system created in order to provide Grantham Scholars the skills and expertise needed to advocate for evidence-based change in a diverse range of public and policy settings and to take public roles as activists in sustainability causes. We focus on seven core areas that enable Grantham Scholars to turn academic ideas into action on sustainability: research skills, interdisciplinary working, policy engagement, business and enterprise, public engagement, media and digital engagement, and leadership. Festival of Debate. Scholars organise a series of public talks and discussions in conjunction with Festival of Debate, bringing key sustainability organisations and thinkers to the University. 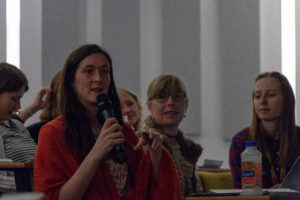 Scholars are given support to organise and run the day’s programme, introduce the speakers, chair discussions, and promote the event before and after. How to Write 101. This course covers the basics of writing content for any medium, including blogs, opinion pieces, creative writing and social media. Attendees are shown how to make engaging content on any topic, a vital skill for researchers hoping to communicate their work. UK Parliamentary Impact and Engagement. In partnership with Newton’s Apple Foundation this workshop demonstrates how UK public policy is formulated by Government, then debated and legislated by Parliament. The workshop provides an opportunity for the students to engage with individuals who are, or who have been, actively involved with policy and law-making or in providing advice to Government or Parliament. Guidance is given on how researchers can become involved in providing evidence or advice to policy makers and legislators during the processes involved in policy making.